School is starting or has started for a lot of students this week as evidenced by the uptick in dorm room bean bag and laundry basket purchases at Target. Heavier than usual traffic clogged the roads last week heading east from the mountains. No one heads east (toward Denver) from the mountains unless they have to… the school year commenceth. 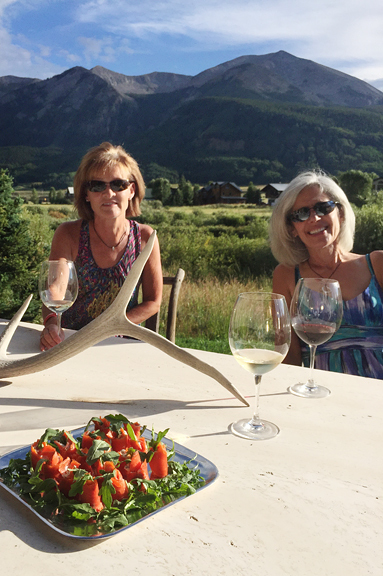 Our last few days in Crested Butte were a whirlwind of activity as we wrapped up summer in our special mountain hamlet. Truth be told, I think it’s normally a windstorm of activity, but Neva turns everything into a whirlwind. 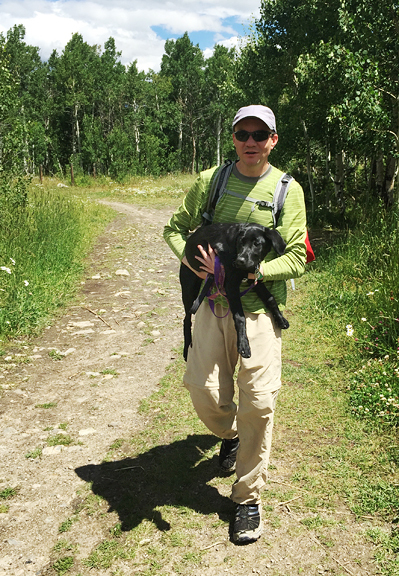 The day before we returned home to the Front Range, I was picking my way along a deer trail that was lined with chanterelles. Jeremy and I refer to it as the Trail of Happiness. I had watched the mushrooms grow over the past week and was ready to harvest some to take home. 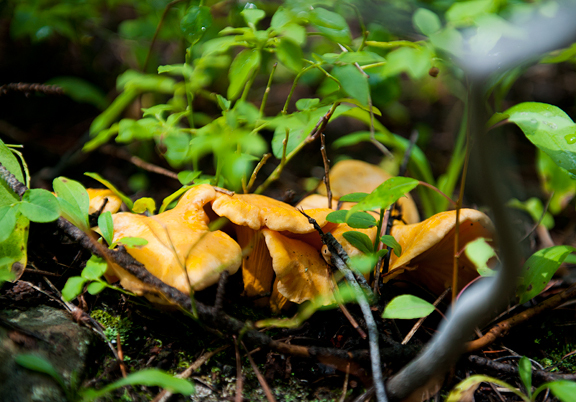 The rains in and around Crested Butte had been stoking the chanterelle (and everything else!) flush and they just kept coming. I’m careful to only harvest a fraction of what is growing, cutting rather than plucking (it’s better for the preservation of the patch and continued fruiting throughout the season). Besides, there were so many that I couldn’t put a dent in the mushrooms even if I wanted to. Looking back up the slope I had just foraged, I couldn’t tell that I had picked any at all! Just then my phone buzzed the side of my leg. Mom texted me and asked what I was doing. I replied that I was foraging chanterelles for her birthday dinner. 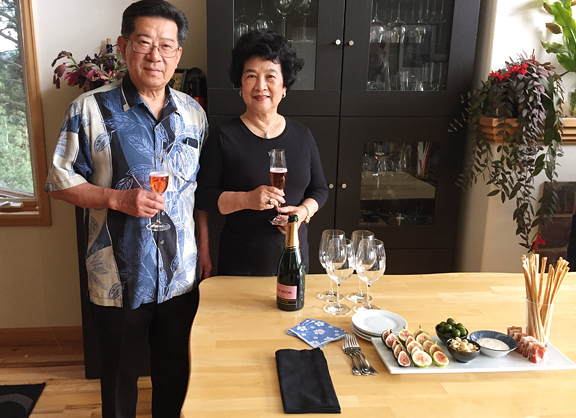 Since my parents spend their summers in Colorado, I get to celebrate my mom’s birthday with her and that means a lot to me. My mom always puts everyone else first. She takes care of others before thinking about her needs or her wants. 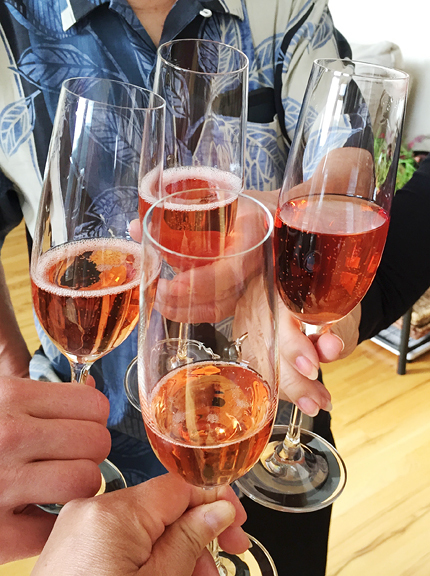 This birthday wasn’t a special number – 16, 21, decadal, or whatnot – but that doesn’t matter. It’s a birthday. It was my mom’s birthday and I wanted to do something nice for her because I can… Something to ease the pain of Kris’ birthday just 2 weeks prior. Something to let her know how much I love her. 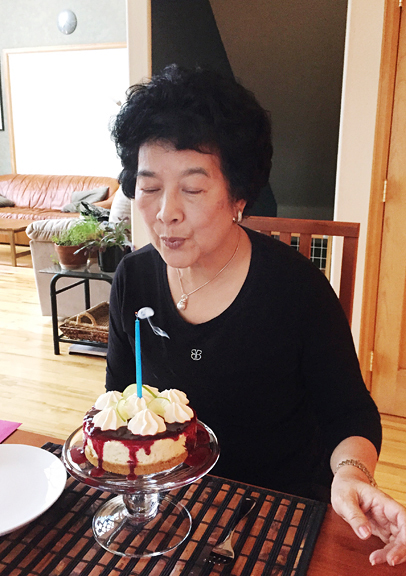 I learned that my friend’s mother had passed the morning of Mom’s birthday and my heart ached. Loss is never easy, but it always reminds me to cherish the relationships I have while I can. i hope she made a good wish! At one point, Mom came into the kitchen to watch me plate the vols au vent. She asked about the chanterelles and I showed her one of my many brown paper bags of fresh chanterelles in the refrigerator, pulling a particularly beautiful and delicate one out for her to smell. People say they smell like apricots, but if you close your eyes, I find they smell more like almonds and ever so faintly of bayberry candles – the kind you found in the 1980s in Colonial Williamsburg gift shops around the holidays. I think the gorgeous color is what prompts that whole apricot notion. They say if porcini are the kings of the mushroom world (they are called king boletes) then chanterelles are the queens. Finding a king in the woods is akin to a high-stakes Easter egg hunt. Porcini are heavy and hefty in your hand – solid and stout. Thrilling. Stumbling across a chanterelle patch is essentially striking gold. Delicate and frilly as if they came from the sea – chanterelles are especially coveted by me because they don’t have worms. Super bonus awesomeness. I am enchanted. Mom asked what on earth I was planning to do with all of those chanterelles. Funny she should ask. I spent the 5 hour car ride home from Crested Butte brainstorming recipes to make and shoot with chanterelles. I even had a container of one recipe for her to take home. So in addition to the leftover party food, Jeremy and I have been wading through chanterelle recipe after chanterelle recipe. Jeremy tells me this is a hardship he willingly endures. 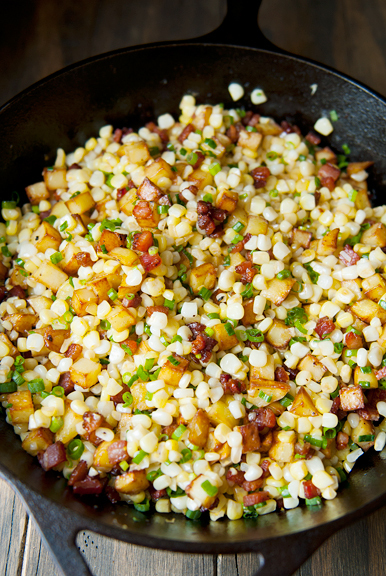 This bacon corn hash recipe comes from Deb at Smitten Kitchen, because I can’t resist the sweet ears of Colorado Olathe corn that are in season right now. I just modified it with chanterelles fried in bacon grease, because it was the right thing to do. Unlike porcini, you can actually find fresh chanterelles in some stores during certain times of the year around here. They just cost a fortune and aren’t as fresh, but they will work if that is what you seek. You can also substitute any kind of mushroom you fancy because I’m not going to snob out on you and judge. And many people have told me that it’s okay to wash mushrooms, but I prefer to wipe or brush mine clean as do most of the chanterelle foragers I know. For the flecks of debris in the ridges (they look like gills, but are really ridges), I use a puffer to blow them out (a Giotto Rocket which I use to clean my photography equipment). I got the thickest cut bacon I could find at the meat counter without having them custom slice it for me. It fried nicely and gave up all of that lovely lovely bacon grease which in turn is used to fry everything else. As my regular readers know, when it comes to potatoes, Yukon Gold is my go to potato. 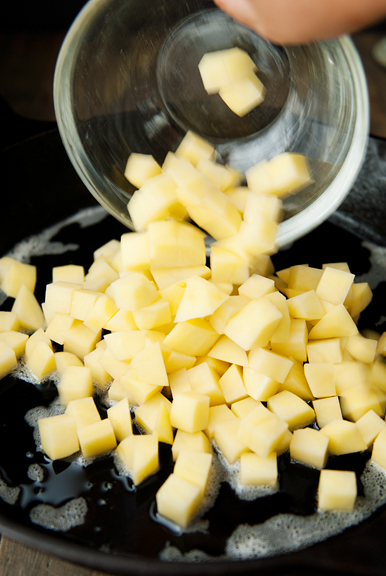 After the potatoes are browned, remove all but a tablespoon of the bacon fat from the pan. 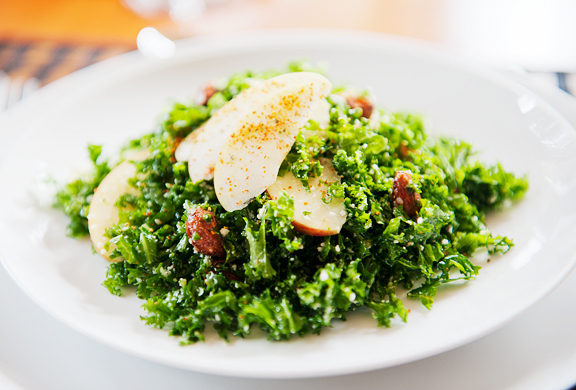 Don’t throw the extra bacon fat out! 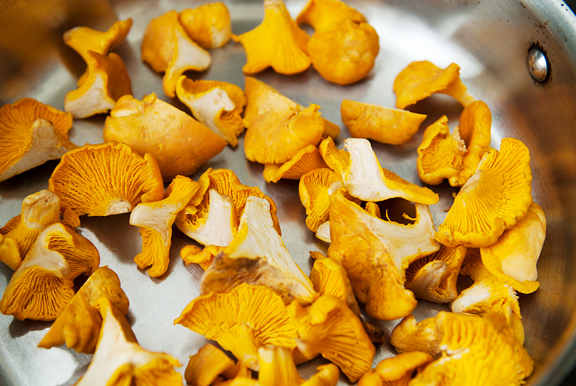 Reserve a tablespoon of it for the chanterelles. 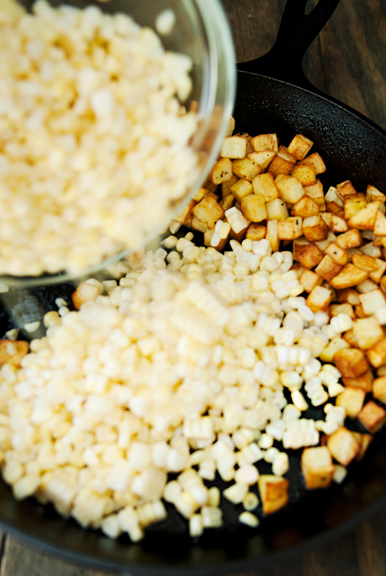 Add the corn to the potatoes and let them sauté for a few minutes. 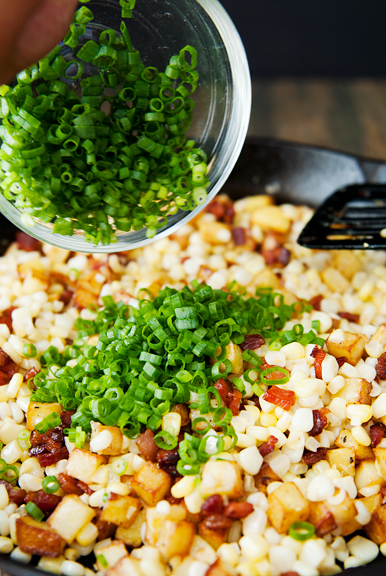 Then add the bacon and green onions. 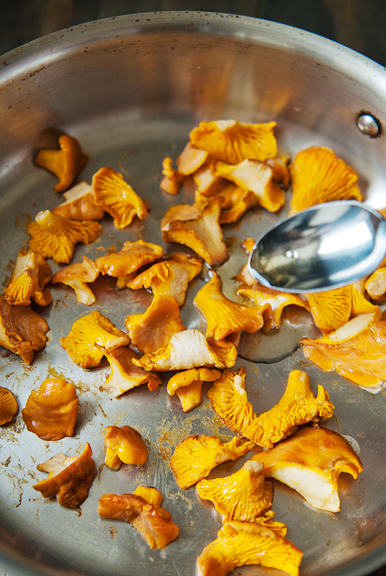 For the sake of serving everything hot, you can start to dry fry the chanterelles in a separate frying pan. Just pop the slices into a pan over high heat and let them wilt. They will give up some liquid since mushrooms are about 90% water. Once the mushrooms have wilted, add a tablespoon of bacon grease to the hot pan, sprinkle a pinch of salt, and watch the mushrooms sizzle. Let the mushrooms cook until browned, flipping gently to brown the other sides. If you, like me, can’t stand the thought of serving this without a fried egg on top, then keep your flame on the mushroom pan. Remove the mushrooms from the pan and add some more bacon grease (why not?) and crack an egg into the pan. 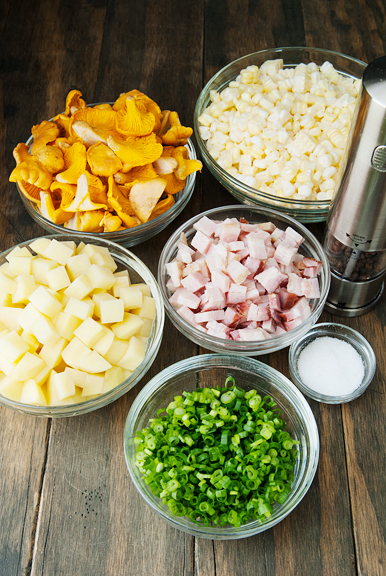 Set the mushrooms over the bacon corn hash and season with some salt and pepper. 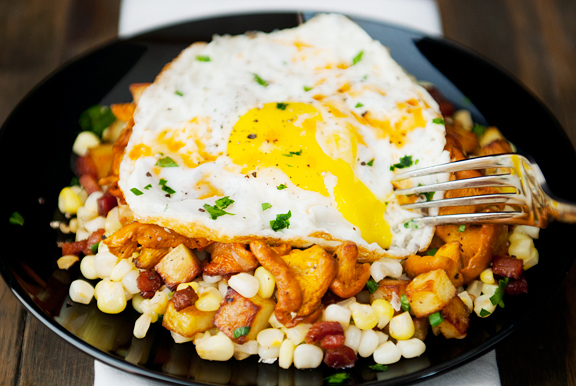 Top the whole thing with the egg (or eggs if you want to serve it all in one pan). This is savory breakfast heaven with sweet, savory, earthy, herbal, and eggy flavors all mixed together. A dash of Tabasco and I’m good to go! 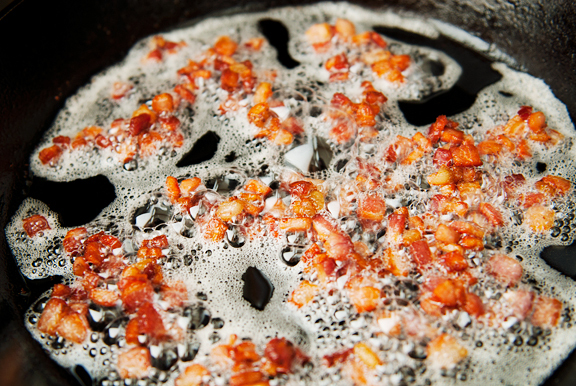 Cook the bacon over medium heat in a skillet or frying pan until browned, stirring occasionally to cook the bacon evenly. Place the bacon in a plate, leaving the bacon fat in the pan. 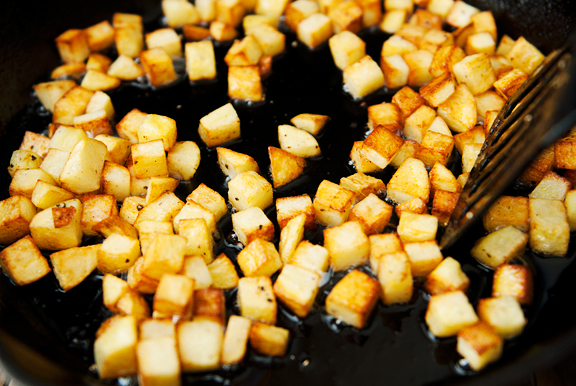 Turn the heat up to medium-high and fry the potatoes in the bacon grease. Season the potatoes with salt and pepper. Let the potatoes sit until the bottoms brown and then begin stirring or flipping the potatoes around so the other sides get a chance to brown. 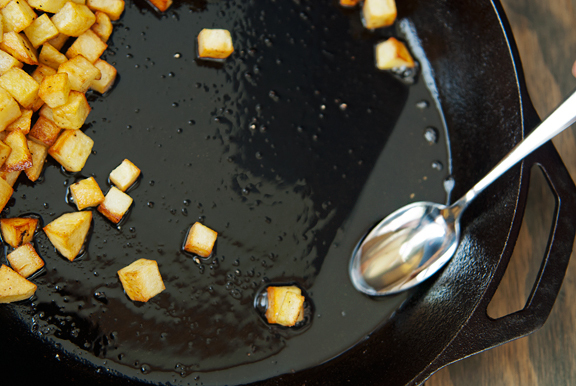 Push the potatoes to the side of the pan and remove excess bacon grease to a small bowl. Leave about a tablespoon with the potatoes. Turn the heat on high and add the corn to the potatoes. Sauté for 3 minutes then add the bacon. Remove from heat and stir in the green onions. In another fry pan, heat the chanterelles over medium-high heat and dry fry them until they wilt. 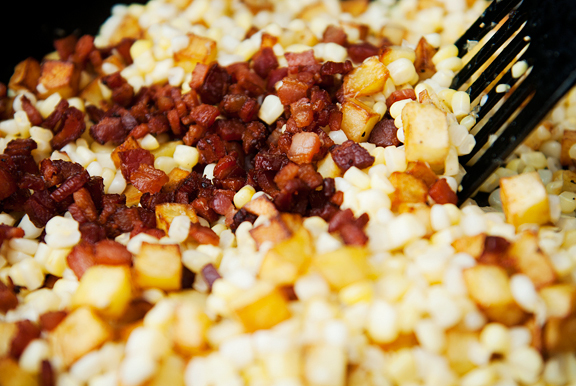 Add a tablespoon of bacon fat to the pan and a sprinkle of salt. Sauté the mushrooms until they are cooked. 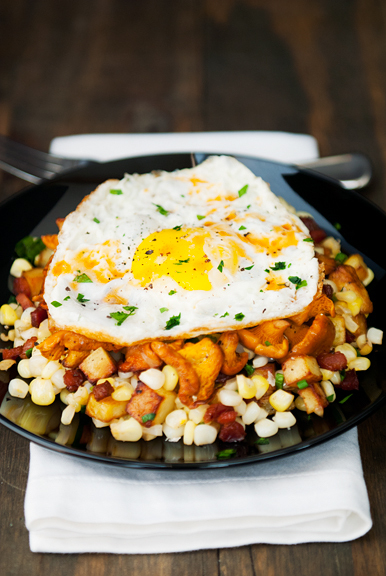 Serve the mushrooms over the bacon corn hash. It’s even better topped with a fried egg and a sprinkle of chopped parsley. Serves 4. The boyfriend’s mouth is watering as he drives and i describe the recipe. So happy your mother was with you after your sister’s birthday. Love the tuckered Neva pictures. Check out the winter squash, chanterelle and red wine panade recipe from Chez Panisse Vegetables, It’s a great winter dish, and is not degraded if you saute and freeze the chanterelles for later use. Such a great combo of flavors and so warming after a frosty day outdoors. 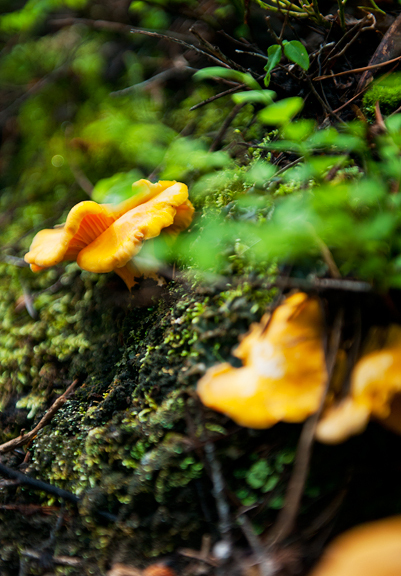 I love you, I love Deb, and I love me some chanterelles — what a delicious post, thank you! What an abundant overflow of chanterelles and so nicely trimmed and presented! I’m jealous. Living in a city your founds really make me envious. And they are so pricey here, too. – The cleaning is a lot of work though , I know… ;-) Well done harvesting them so carefully. I fully agree with you calling them the queens of mushrooms. Mmmh, the combination of chanterelles and corns sounds (and looks) so good. I love how you described your mom and how you were talking about her… Very touching. Love the photos of her, too. Just got back from backpacking in Wyoming and finally, finally had huckleberries! Yep, better than blueberries. I did manage to score 2 jars of homemade jelly from the farmer’s market, a bit pricey, but canning or freezing any on the trail was not an option. I’m saving those 2 little jars for a special occasion. Thanks for turning me on to them! 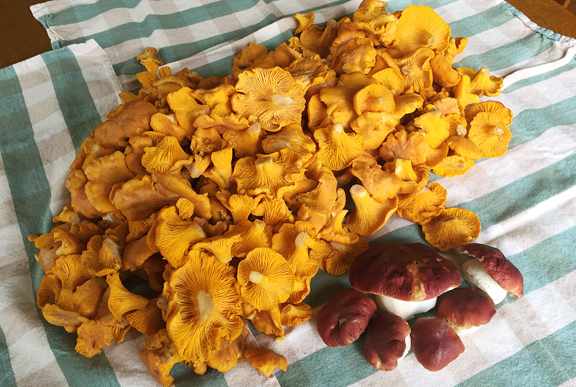 Loving those chanterelles, keep the recipes coming! You are absolutely poetic when writing about mushrooms. Beautiful. 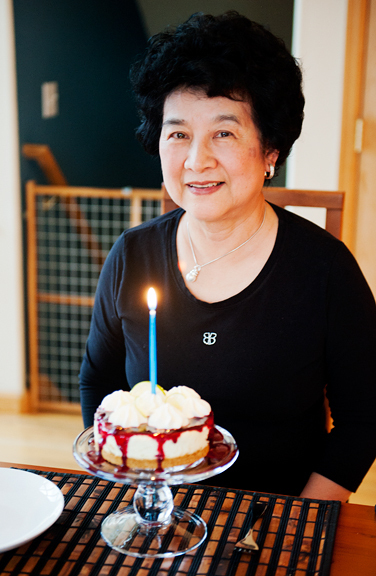 Happy Day, Happy Year Mother Yu. Oh. My. Gosh. A little slice of heaven right here. Thank you. Heather – I wish I could give EVERYONE a trail of happiness! I truly believe the world would be a better place if we could all forage chanterelles! Amber – we love it when Neva is tuckered, too! 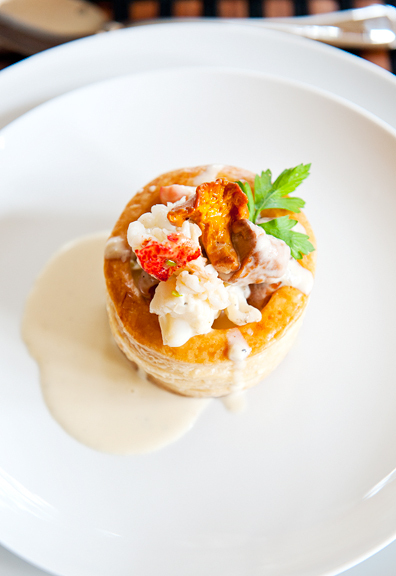 Jasmine – oh, I decided to forgo the deep-frying since there are so many decadent recipes as it is. But I’ll keep it in mind for next year! 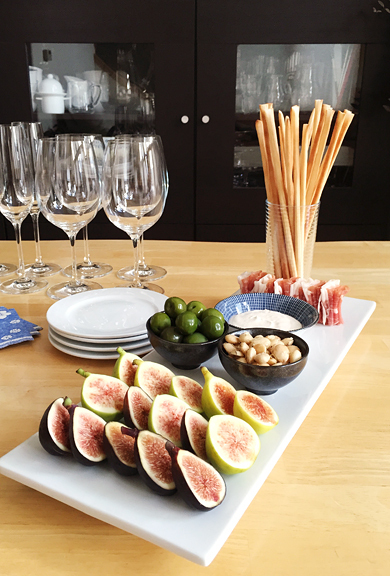 Sabina – thanks for the tip! 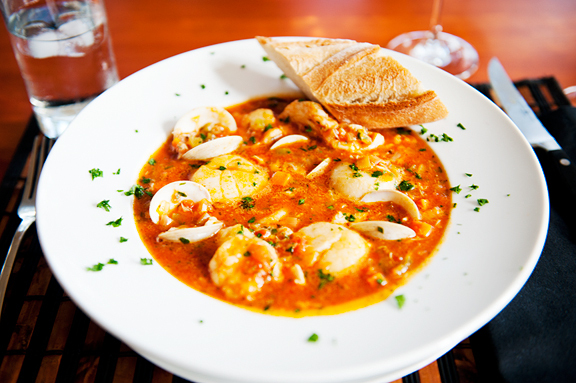 Marcia – I love that recipe, too! Makes me glad that others enjoy it as well. What a great find, right? Kimberly – you’re so welcome! 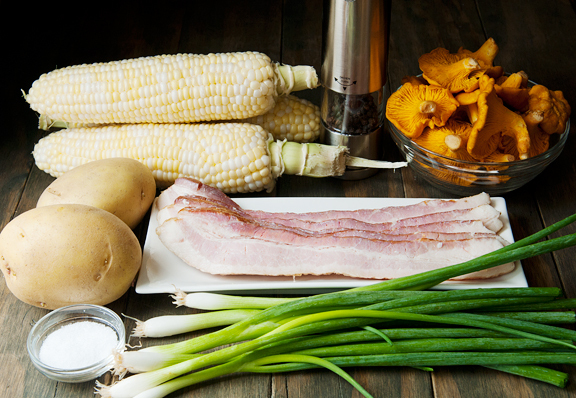 Heather – the chanterelles are just lovely with corn and bacon!